Old West is a brand of beef jerky manufactured by Peoples Sausage Company, based in Los Angeles, CA. Peoples Sausage has been in business since 1929, making sausage, bologna, hot dogs, and beef jerky. It's a 3rd generation family-run business, now run by the grandson. In addition to this "Old West" brand, the company also produces another brand called, "People's Choice", which is apparently their flagship beef jerky brand. The company also makes another line of beef jerky they describe as the "really, really old style" beef jerky that distribute to specialty stores and mexicantessens, featuring ethnic flavors not normally seen in traditional beef jerky. This particular package of Old West doesn't advertise a particular flavor variety, aside from "Western Style". Beef, soy sauce, sugar, worcestershire sauce, liquid smoke, onion powder, garlic powder, pepper, sodium nitrite. When I take a bite out of a piece, a slight sweetness is what I taste on the surface of these pieces, followed by a soy sauce taste. Upon chewing, the natural meat flavors come out. A black pepper taste comes later, and eventually dominates the aftertaste. I'd say the flavor that sits at the forefront of this jerky is the soy sauce and its saltiness. The black pepper is well defined in this also. The soy sauce flavors lasts through the chew, but then the natural meat flavors come on a lot stronger by that time. This is a salty jerky. Even though the nutrition label shows something of a moderate amount of sodium, it's well defined in this variety because it's largely the soy sauce that dominates the flavor. 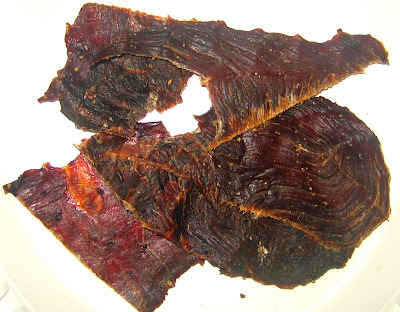 Overall, this jerky has a good taste, mostly as soy sauce and black pepper, which is an all-too-familiar combination, along with a good natural meat flavor. The saltiness makes it somewhat of a challenge for me, since I don't really care much for strong salty taste in jerky. These pieces appear to be cut from real slices of meat, sliced thin to medium thickness, and in medium sized pieces. This is a dry jerky, with almost no flexibility if bent with the grain, or against. I found it easy to tear apart if I tear it along with the grain. Against the grain, it's very difficult. It's moderately easy to eat. I found some streaks of gristle in most of these pieces, but they were thin enough and dry enough that they broke apart and chewed without much notice. However, one piece had a thicker piece of gristle that did offer a jaw exercise, but still chewed ok. Otherwise, no chewy tendon, and no fat, except for one piece that had some good marbilization. Overall, the meat consistency is ok. I like dry jerky, but this is so dry that pieces of it break off and fall into my lap as I tear a piece off. If it didn't crumble like this, I'd overlook it. There's also a good amount of gristle in this, though most of it was chewable and didn't present too much of a problem. I paid $2.99 for this 1.8oz package at Pine Mountain General Store in Pine Mountain Club, CA. That works out to $1.66 per oz, making this an average priced jerky. If the company offers a larger package, I'm guessing it'll be priced cheaper per oz. For an average priced jerky, this appears to be an average value. 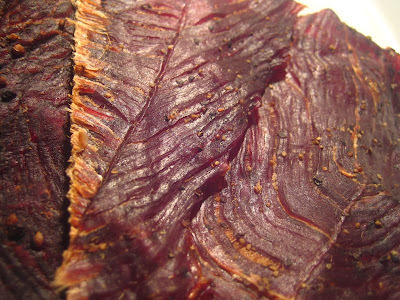 If you like the dry, thin cut jerky, this may give you what you're looking for. While it has a good taste, it's not a taste that's going to win you over as a favorite. It's kinda salty, actually. For its natural meat flavor, it's a good buy. As a peppered variety, it's also a good buy. As a "Western Style" jerky, which the package advertises, I'm guessing that it fits the bill. I suppose something like "western style" is open to interpretation. My guess is that it's something dry, thin cut, and largely salty as its dominant flavor. That's what this is. For that matter, it's a good buy. While it's flavorful, it's largely a soy sauce variety that I found to be too salty for my preference. I do enjoy black peppered jerky, and this jerky is also that. It also retains plenty of its natural meat flavors. And it's still relatively easy to eat. All that makes this snackable, and deserving of an average rating. Aside from offering some good natural meat flavors, I couldn't find anything else that stood out enough to warrant a higher rating. Very good review. I find that it is good jerky - got some right here - kind of close to some made from Richter Enterprises (a staple for me growing up in Texas). Love this site by-the-way! 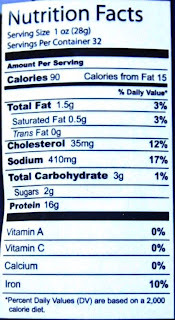 One thing that stood out to me about Old West (since I have been writing down my cals, carbs, fat and protein intake) is the nutrition label which says: 32 servings! That leads to 512g of Protein, and 2880 cals! Little bit off. I'm expecting maybe 4 or 5 servings in real life.